The New Jersey Campaign for Alternatives to Isolated Confinement hosted a rally outside New Jersey State Prison, calling for an end to solitary confinement in New Jersey and chastising Governor Christie for vetoing The Isolated Confinement Restriction Act (S.51/A.547) last month. 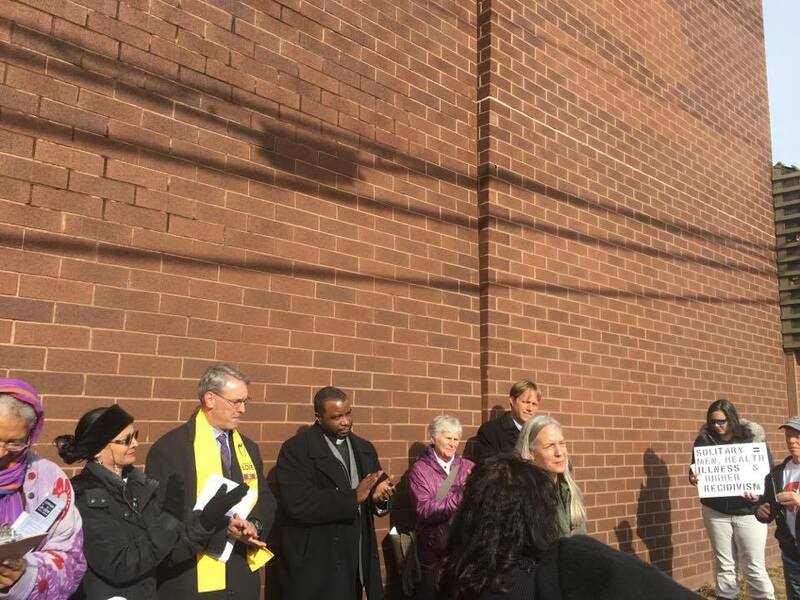 Sponsoring the event were 18 organizations who are NJ-CAIC members and allies, and over 100 people assembled outside the facility that reportedly pioneered the modern practice of isolation in the U.S. The rally featured 17 speakers, including gubernatorial candidates Ray Lesniak (sponsor of S.51) and Seth Kaper-Dale, as well as 4 first-hand survivors of prolonged isolation in NJ prisons. Thanks to Students for Prison Education And Reform (SPEAR) from Princeton University, a Facebook Live stream of the event is available to the left, and below is a gallery of photos from the event. Scroll down also to read the official NJ-CAIC press release. Trenton, NJ - January 10, 2017 — Human rights advocates are preparing to assemble on Wednesday, January 11thalong Cass Street outside New Jersey State Prison in Trenton. They will be condemning the use of solitary confinement in New Jersey prisons. The rally is scheduled for 12:00pm and is being hosted by the New Jersey Campaign for Alternatives to Isolated Confinement (NJ-CAIC), whose members and co-sponsors include 18 advocacy organizations and many additional faith and community groups. Last October, NJ-CAIC and its allies celebrated the full passage of S.51/A.547 through both houses of the New Jersey legislature. Titled “The Isolated Confinement Restriction Act,” it aimed to dramatically reduce the number of prisoners housed in isolation units and called for stronger protocols and greater transparency by the Department of Corrections. In December, Governor Chris Christie vetoed the bill, and published a memo stating that New Jersey does not use solitary confinement. Senator Raymond Lesniak, the primary sponsor of S.51, plans to speak at the rally, healthcare advocates, formerly incarcerated individuals, faith leaders, and human rights groups. Delivering the keynote address will be Larry Hamm, president of the People’s Organization for Progress. The full list of co-sponsors for the event include: The American Civil Liberties Union of NJ, The American Friends Service Committee, The Campaign to End the New Jim Crow - Trenton and Princeton chapters, Health Professionals and Allied Employees of NJ, The Integrated Justice Alliance, The Jewish Alliance for Change, Lutheran Episcopal Advocacy Ministries of NJ, The National Religious Campaign Against Torture, the New Jersey Association of Black Psychologists, The New Jersey Institute for Social Justice, The People’s Organization for Progress, Salvation and Social Justice Coalition, Students for Prison Education and Reform - Princeton University, T’ruah - the Rabbinic Call for Human Rights, The Unitarian Universalist Legislative Ministry of NJ, The United Methodist Church Board of Church and Society - Greater NJ, Women Who Never Give Up, and additional advocates, faith leaders, and congregational committees in NJ. Newer PostEVENT April 14-15 "Toward Abolition: Dismantling the Carceral State"